Hiking trail level is considered to be easy to moderate. Fishing allowed in nearby creeks. Abrams Falls and its creek are both named for a Cherokee chief whose village once stood several miles downstream. The hike is 5 miles round trip and considered moderate in difficulty. Due to strong currents and an undertow, swimming in the pool at the base is extremely dangerous. Swimmers have drown here! Don't be the next victim! Please read additional water safety information. 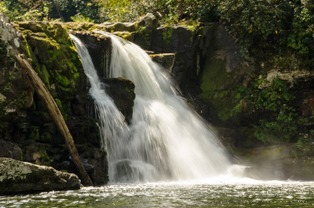 The Trailhead is a hike to one of the Great Smoky Mountain's most beautiful waterfalls! These falls stand 20 feet tall with rushing waters falling majestically into a picturesque pool! This 1.7 mile, (2.7 km) part of the trail is rarely used. It takes you over some ridges and crossings before coming to a two-way junction known as the Hannah and Hatcher Mountain Trails. Go left to hike Hannah Mountain,or take the right to take the Hatcher Mountain trail. Located inside the Cades Cove area, it runs parallel with Abrams Creek, which is known for being the longest stream in the Smokies. These falls plunge 20 feet over a natural pool that stands 100 feet wide. It's one of the largest in this area. Most everyone wants to go swimming, however, it is not recommended! If you're thinking about hiking this trail-head, come prepared! It's always a good idea to carry drinking water with you! Dress comfortably, and wear walking shoes that fit well. As you see, the usual hiking essentials are a good idea for this trail. Bring snacks along, but for your safety, and that of the black bear, dispose of all litter responsibly. Although this hike is relatively short, it's important to know the basics. If you carry the right essentials, you'll stay safe, and comfortable. Carry a map, or compass and be aware of where you are at all times. Dress cool and wear a hat. The sun is bright during the summer and temperatures are in the upper 80's and 90's. For winter, and fall, have a coat, or jacket. The best way to get to Abrams Falls is through Gatlinburg. Go straight until you reach Sugarlands Visitor Center. Turn right onto Little River Road. When you reach Cades Cove, you'll travel the 11-mile loop road about half way. You may also reach the falls through Townsend by taking TN 321 to the Great Smoky Mountains National Park entrance and turning right onto Little River Road. Once you arrive, you'll come to a parking area where the hike to the falls begins. There are clearly marked signs to the wooden bridge at the end of the parking area where the hike begins. From Townsend, you should take TN 321 to the national park entrance, turn right on Little River Road and head toward Cades Cove. To reach the Abrams Falls trail head, you’ll need to drive along the one-way Cades Cove Loop Road approximately 5 miles, and turn right onto a gravel road that ends within 0.5 mile at a parking area. Signs mark the area well, but you should know you’ve gone too far if you get to the Cades Cove Visitors Center. The Abrams Falls trail begins at the wooden bridge at the end of the parking area. For the complete "Day Hiking" check list, click this link http://www.rei.com/learn/expert-advice/day-hiking-checklist.html. It is very important to have all the essentials needed before going into the mountains!